We now live in a fast-paced, cognitive economy, and our expectations have been changed irrevocably by two undeniable shifts. Technology is evolving at an eye-watering rate, with completely new architectures and novel services for all aspects of computing being released every year, State of the Art from only a few years ago is now a drag on speed or an in-built glass ceiling on capability. This technology feedback loop has inflated user expectations to an extraordinary level. The average user, whether staff member, business partner or consumer, expects everything they need to be available through their mobile device, with cognitive apps that make everything smarter and easier. This interaction is outlined in Figure 1 below. For CIO's and software professionals, focusing on individual shifts of technology, like big data, mobile and cognitive are gone, and we can no longer use a single theme to keep abreast of the market. Instead, we must have a unified vision, integrating all of the shifts, and the inflated User Expectations presents a double-edged sword. On the plus side, their CEO's see opportunity for increased revenue, with almost two-thirds (63%) of Australian CEO's setting revenue growth as a priority for their in-house development groups.2 If one has the right approach to technology and DevOps, one can create great advantage over competitors who do not, CIO's need to be creative. So, if CIO's face a constant barrage of change, with increasing levels of sophistication, which they lack the skills to surmount, plus they have a legacy. How are they to sensibly proceed? Developing Cognitive Mobile Apps that disrupt the way products/services are delivered, the effectiveness with which staff are enabled, and/or the way customers are engaged. Integration of all Consumer Touchpoints and all marketing services into a single, cohesive framework that also includes partners (e.g. advertising etc. ), proximity services etc. How can these demands be implemented as speedily as possible on top of any existing legacy systems in a cohesive, robust manner? What can a CIO do if they lack the internal skillsets needed to solve all of these challenges, and don't want deep engagements with consultants? There is a view that a CIO can take that resolve all of these difficulties. There are two interrelated issues to consider, firstly the tools and architectures one uses to move as quickly and cohesively as possible, and secondly the maturity and capability of the DevOps process (i.e. architecture plus production process). With respect to the tools and architectures, starting simple with simple tools can sometimes be the worst way to start, as it can build in a glass ceiling, as additional, unforeseen requirements suddenly mean the technology platform has to be stretched beyond its use case. In parallel, the blog will also feature posts on increasing the agility of DevOps (e.g. DORA DevOps benchmarking service etc.). Each of these posts will highlight a single aspect of the challenges facing that of the CIO, dealing with spiralling demands and levels of sophistication. Together, the posts will show that a CIO can develop disruptions if they adopt agile, smart and unified thinking to form a resilient fabric, without holes. DORA and Puppet, State of DevOps Report, DORA, Editor. 2016: https://puppet.com/resources/white-paper/2016-state-of-devops-report. 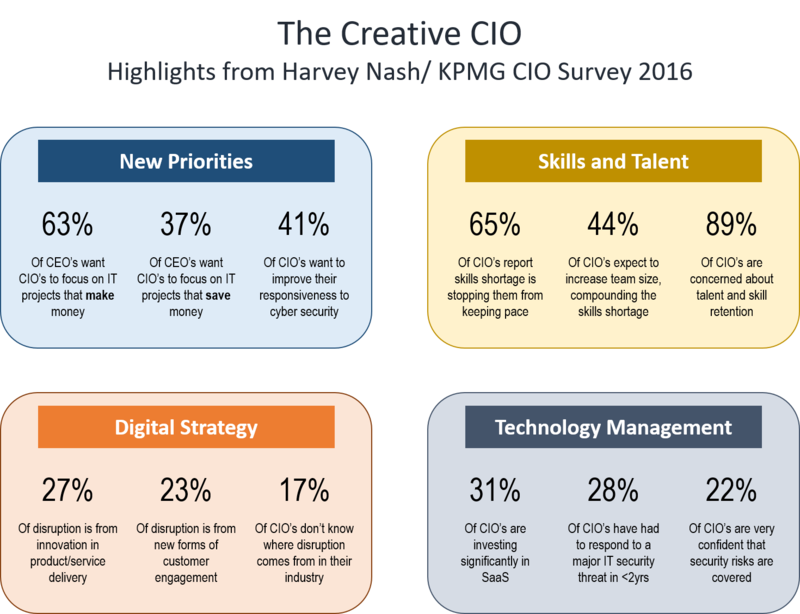 KPMG and Harvey Nash, The Creative CIO 2016, in Harvey Nash / KPMG 2016 CIO Survey Results 2016: http://www.kpmg-institutes.com/institutes/advisory-institute/articles/2016/05/cio-survey-harvey-nash-2016.html?utm_source=CIOsponsorship&utm_medium=BackupblogTopChallengesOfCloud&utm_campaign=C-00028094&cid=C-00028094.